Dietary Considerations in Migraine Management: Does a Consistent Diet Improve Migraine? The clinical expression of migraine is significantly impacted by dietary and gastrointestinal issues. This includes gut dysfunction during and between attacks, food triggers, increase in migraine with obesity, comorbid GI and systemic inflammation influenced by diet, and specific food allergies such as dairy and gluten. Practitioners often encourage migraineurs to seek consistency in their lifestyle behaviors, and environmental exposures, as a way of avoiding sudden changes that may precipitate attacks. However, rigorous evidence linking consistency of diet with improvement in migraine is very limited and is, at best, indirect, being based mainly on the consistency of avoiding suspected food triggers. A review of current data surrounding the issue of dietary consistency is presented from the perspective of migraine as an illness (vulnerable state), as a disease (symptom expression traits), and with a view toward the role of local and systemic inflammation in its genesis. Firm recommendations await further investigation. Dr. Alan G. Finkel, Juanita A. Yerry PA-C, and Dr. J. Douglas Mann reported no potential conflicts of interest relevant to this article. • Noseda R, Burstein R. Migraine pathophysiology: anatomy of the trigeminovascular pathway and associated neurological symptoms, CSD, sensitization and modulation of pain. Pain. 2013. doi: 10.1016/j.pain.2013.07.021. A review of contemporary ideas in translating the biology and anatomy of the nervous system into and understanding of migraine, this paper offers the reader a one-stop description. The relevance to the understanding of all of headache medicine is worth the read. • Ramsden CE, Faurot KR, Zamora D, Suchindran CM, Macintosh BA, Gaylord S et al. 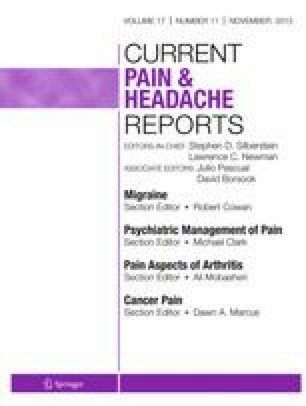 Targeted alteration of dietary n-3 and n-6 fatty acids for the treatment of chronic headaches: A randomized trial. Pain. 2013. doi: 10.1016/j.pain.2013.07.028. As a part of a series of papers resulting from a NIH/NICAM grant, the authors describe the trials and outcomes. With citations 77 & 78, the reader will be brought up to date on this interesting area of research, translating biological and clinical data into a series of real world recommendations. Amandusson A, Blomqvist A. Estrogenic influences in pain processing. Front Neuroendocrinol. 2013. doi: 10.1016/j.yfrne.2013.06.001. Smith AW, Bosch MA, Wagner EJ, Rønnekleiv OK, Kelly MJ. The membrane estrogen receptor ligand STX rapidly enhances GABAergic signaling in NPY/AgRP neurons: role in mediating the anorexigenic effects of 17β-estradiol. Am J Physiol Endocrinol Metab. 2013. doi: 10.1152/ajpendo.00281.2013. Jackson JL, Shimeall W, Sessums L, Dezee KJ, Becher D, Diemer M et al. Tricyclic antidepressants and headaches: systematic review and meta-analysis. BMJ. 2010. doi: 10.1136/bmj.c5222. Vivinus-Nébot M, Frin-Mathy G, Bzioueche H, Dainese R, Bernard G, Anty R et al. Functional bowel symptoms in quiescent inflammatory bowel diseases: role of epithelial barrier disruption and low-grade inflammation. Gut. 2013. doi: 10.1136/gutjnl-2012-304066. Perez-Leighton CE, Billington CJ, Kotz CM. Orexin modulation of adipose tissue. Biochim Biophys Acta. 2013. doi: 10.1016/j.bbadis.2013.06.007.